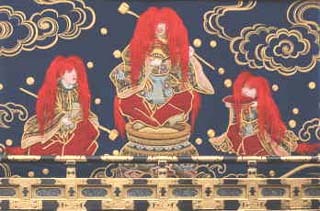 A shōjō (猩々 heavy drinker) is a kind of Japanese sea spirit with red face and hair and a fondness for alcohol. The legend is the subject of a Noh play of the same name. Mythical creatures named "shēng shēng" (狌狌) or "xīng xīng" (猩猩) are mentioned in three passages of the Shan Hai Jing ("The Classic of Mountains and Seas"). There is a tale involving the shōjō and white sake. There was a gravely sick man whose dying wish was to drink sake. His son searched for it near Mount Fuji and came across the red shōjō, who were having a drinking party on the beach. The shōjō gave him some sake after listening to his plea. Since the sake revived the dying father, the son went back to the spirit to get more sake each day for five days. A greedy neighbor who also wanted the sake became sick after drinking it. He forced the son to take him to the shōjō to get the good sake. The shōjō explained that as his heart wasn't pure, the sacred sake would not have life-restoring benefits, but instead had poisoned the neighbor. The neighbor repented, and the shōjō gave him some medicine to cure him. The father and the neighbor brewed white sake together. The kyogen-influenced Noh play shōjō or shōjō midare features a shōjō buying sake, getting drunk and dancing ecstatically, then rewarding the sake seller by making his sake vat perpetually refill itself. The shōjō from the play have been made into wooden dolls (Nara ningyō), they are one of the "most common" wooden dolls derived from Noh plays. Shōjō dolls are used to ward against smallpox. The Japanese artist Kawanabe Kyōsai, who was also known for his heavy drinking and eccentric behavior,humorously referred to himself as a shōjō. The Chinese characters are also used for an orangutan. 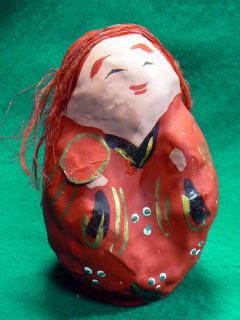 shoojoo 猩猩 Shojo "heavy drinker"
This red amulet wards off disease, especially smallpox. This comes as a set with a red Daruma and a sake cup. A mother bought it when the child was ill. It was placed on a red sheet of paper beside the hearth of a family with small children. The mother would bring offerings of rice and sake every day and pray for the good health of her children. At night, she would lay down the Shojo figure to take a rest and sleep. Having thus prayed for seven days, she would carry the figure to the outside of a village, place it behind a large tree or float it down the river to take away the disease from her child ... as a kind of migawari 身代わ御守.
. Amulets from Shiga prefecture .
. Daruma, Smallpox and the color Red .
. Migawari . the deities substitute for us .
. . . CLICK here for Nara Carving Photos ! Red Shojo run along the road and grab little children, If they get a child, it will not suffer from any disease during the summer. The Shojo are men who wear a paper mask on a bamboo construction, so they are about 2 meters high and children fear them a lot. The festival is already mentioned in records from the year 1757. In Narumi, the legend knows that the Shojo came out of the sea and walked in the town. or a tengu goblin with a long nose and red face. On the fourth sunday of July. It starts on the Saturay evening and many events take part in the morning (asa matsuri 朝祭). On Saturday evening, many lanterns fixed to boats are floated down the river Tennogawa. During the morning festival, six boats with scenes from the Noh theater are rowed along the river. Main festival a the shrine Tsushima Jinja 津島神社 in Aichi, Tsushima town. It was already painted in the famous illustrations of the Tokaido Road during the late Edo period. This large impressive pair of eight-fold screens shows the boat procession on the Tenno River that was the climax to the festival at the Tsushima shrine. This grand festival was of the three famous festivals of the province of Owari (modern Aichi Prefecture) located between Edo (Tokyo) and Kyoto. The boat procession was held overnight from the 14th to the 15th day of the sixth month (late summer). Floats were mounted on pairs of boats lashed together. On the evening of the 14th, there were five floats, decorated with hundreds of lighted lanterns. 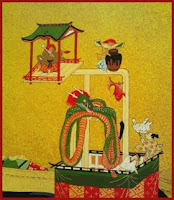 On the morning of the following day six floats came like great towers, some surmounted with dragon sculptures. Each tower had platforms for puppet shows and other entertainments. One of the floats carried a number of young men armed with cloth-bound halberds. One after the other they leapt into the water and swam to Nakanoshima where they dedicated their halberds at the shrine. The young men were warmly welcomed as it was thought that water from the cloth had the power to heal wounds. Along the river banks there are numerous places of entertainment such as a Kabuki dance stage, and stalls and shops selling all kinds of food and other goods. Part of a screen showing the boat along the Tenno River.
. Tsushima Jinja 津島神社 Tsushima Shrine . There are two figures who scoop a drink for each other. Then one of the Shojo makes a summersault into the sake barrel. When he comes out of the barrel, his face is all red. From the festival floats of the Toshogu shrine procession, Owari (Nagoya, Aichi). With more images of the karakuri mechanical doll floats. This Noh play takes place in a village on the Yangtze in China. 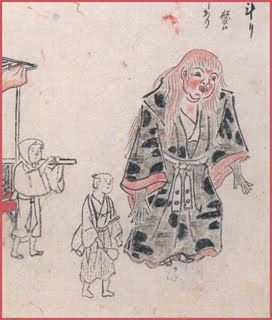 An sprite (shite) who lives in the sea comes before a man named Gao-feng (waki), a wine seller with much filial piety. The sprite gets drunk and enjoys himself by dancing, after which, the man learns that he has received a blessing: no matter how much wine he dips out of the vat, it never runs dry. 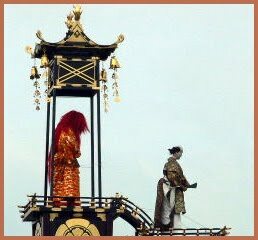 When the play is performed with a special dance called Midare ("Disorder"), the play is called Shojo Midare (The Disorderly Tipster Sprite), or just Midare.
. Shojo Midare 猩々乱 Noh performance . 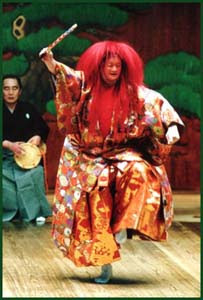 from the Noh play according to the Kanze school. The three Shojo stand around a sake barrel and drink, using dippers. This is a decoration of a festival float from the Chichibu festival.
. "The Narrow Roads of Ricewine"
(Sake no Hosomichi 酒のほそ道) .
. Regional Rice Wine (jizake) . irodori "colorful birds" is a kigo for autumn.
. Festivals of Japan - SAIJIKI . Gabi san, thank you for your guidance for heavy drinker. It is pleasant time to read your sentence, I wish I could drink sake. Any time, Sakuo san, come over any time for a cup ! Moonviewing is on tonight ... and maybe tomorrow ! 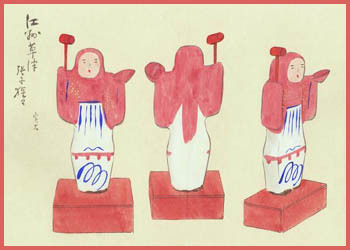 Dolls of this town are realted to warding off smallpox (hoosoo yoke 疱瘡除け). They come in a set. A small Daruma figure is also part of the set. 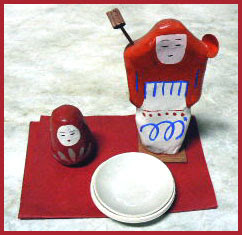 There are two pieces of red paper to place the dolls on, put rice with red beans in the small white dish and make an offering in the morning with the wish for a child to get well from the smallpox. In the evening the two pieces of paper are placed under the pillow of the child. This has to be repeated for seven days. At the end of this period the Shojo doll is taken to the village border and discarded as an offering there, taking with him the smallpox of the child.